40 years ago, American cartoonist Jim Davis published the first strip of a comic called Garfield. Starring a snarky orange tabby and his quirky, socially awkward owner, Garfield proved to be a smash hit, thanks to its simple structure and memorable main cast. However, Garfield’s prominence in popular culture has waned over the years. As a result the team behind Garfield has tried any number of ways to keep the feline relevant in an ever-changing world. The most infamous attempt to revive Garfield came in the form of two live action movies, which starred Bill Murray as the eponymous fat cat. Unsurprisingly, the films were considered critical failures. Still, film wasn’t the only medium that was employed in an attempt to generate renewed interest in Garfield. Believe it or not, there have been a number of Garfield video games released to the general public. None of these titles are all that original or inspired, but none are quite as blatant in their derivative nature as Garfield Kart. 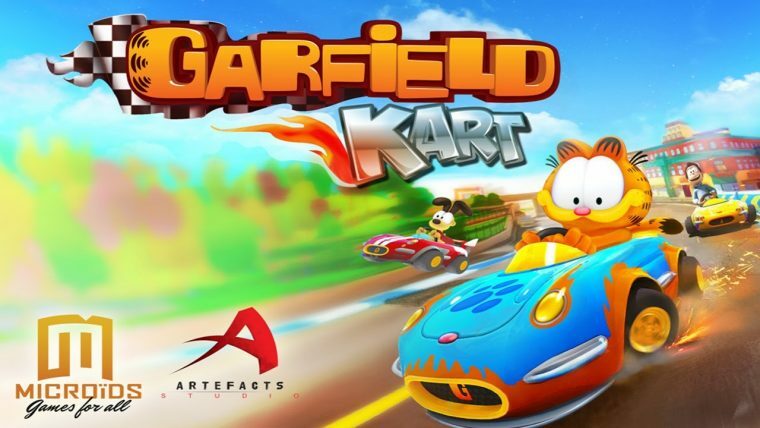 Obviously inspired by the successful Mario Kart series, Garfield Kart tried to capitalize on the success of the kart-racing genre of games. 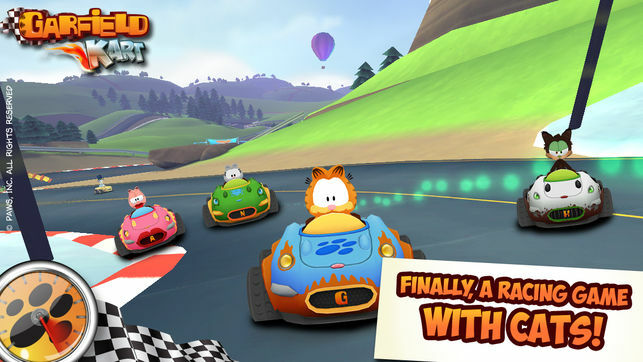 The Garfield-themed racing game was first developed for PC, Mac, iOS, and Android, before eventually being ported to the Nintendo 3DS. Garfield Kart never found financial success on any of these platforms. Yet, it has developed something of a cult status in certain corners of the internet for being one of the worst video games ever released. Using the Nintendo e-Shop, The News Wheel was able to acquire a copy of Garfield Kart to play and review. So, did I hate this game as much as Garfield hates Mondays? That all depends on how much the lazy cat actually despises the first day of the week. If you’ve ever played Mario Kart, or any kart-racing game for that matter, you should be pretty familiar with the basic setup of Garfield Kart. Players can choose between one of eight playable characters from the Garfield lexicon. Some of those characters are instantly recognizable, like Garfield himself and his owner Jon. However, some of them seemed rather obscure to me. I’ll admit, I’m not an expert on the greater Garfield universe, so I had never heard of characters like “Harry,” a black cat with heterochromatic eyes. His in-game bio describes him as being “an alley cat, friend of Garfield, big fan of chicks.” Riveting stuff there. 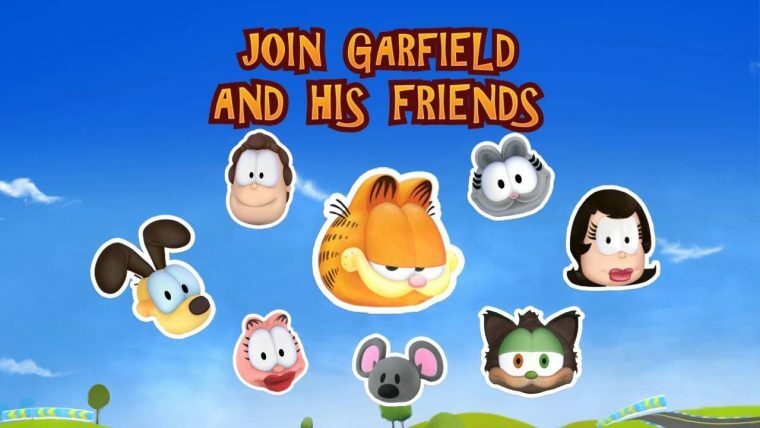 However, before you can unlock Harry or any of the other obscure Garfield characters, you start out only being able to play as Garfield or Jon. I started out by playing as Garfield, seeing as how this was his game. Whilst playing as the fat orange tabby, the game proved to offer quite the challenge. While I was able to outrace computer players in early stages, later stages proved to be quite a bit more difficult. Therefore, I decided to try my hand with Jon. I had assumed Jon would be even more difficult to play as than Garfield, seeing as how Jon is a loser in the comic strip. I was proven quite wrong, as Jon is easily the best character in the game. This game must have secretly been developed by Jon himself as some form of wish fulfillment or escapism from his banal life, as after selecting Jon as my kart racer, I never lost a single race. Photo: Anuman Interactive, Paws Inc.
Each racer has different stats, represented by a speedometer, a steering wheel, and a lightning bolt. The speedometer obviously represents speed, the steering wheel symbolizes handling, and the lightning bolt … well, truth be told, I never figured out what the lightning bolt represents. Acceleration, maybe? Jon has the highest speed stats, while at the same time having poor handling. You might think this would prove to be a problem for Jon, but having good handling isn’t important at all in this game. Speed is the only thing that truly matters or exists. In Mario Kart, if you travel off of the established path, the terrain will slow you down, creating an incentive to have good handling. In Garfield Kart, traveling off the race path results in no slow-downs or negative consequences, thus actually encouraging you to just leave the paved road and cut through mud, sand, or any other terrain featured on the tracks. Also, don’t worry if your kart careens off a cliff. You’re instantly brought back to course, resulting in no time penalty for your mistake. Mario Kart presents players with unique vehicle designs, allowing them to ride a motorcycle shaped like a Bullet Bill or race around in a baby carriage. 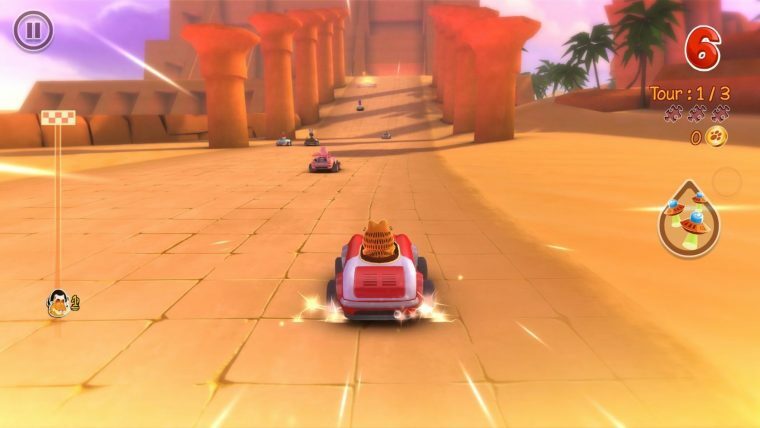 Garfield Kart allows players to select from eight different recolors of the same boring go-kart. Players can add an array of spoilers to their kart, which increases their speed or handling. Of course, since handling is so unimportant, just add the speed-related spoilers if you want to help increase your chances of winning. Another aspect ripped straight from Mario Kart is the in-race items. During Grand Prix races, you can obtain these items, hidden within candy wrappers, to help your chances of winning a race or impede the efforts of competing racers. Most of these items are carbon copies of the items from Mario Kart. Pies and heat-seeking pies take the place of green shells and red shells, while lasagna replaces mushrooms to increase speed. The effects of some of the items are far less obvious. I had to look up what exactly the perfume bottle did, as it turns out that pies can’t be used against you while you are wearing the perfume. Another way for players to customize their racers is by adding headgear to their characters. This headgear either increases the usefulness of an item or minimizes the effect an enemy item has on the player. There are a total of 16 courses in Garfield Kart, segmented into four circuits. To call these levels uninspired would be going easy on the game. Four out of the 16 levels take place in the Egyptian desert. Again, I’m not a Garfield expert, but I don’t remember him spending a lot of time in Egypt. On top of that, another five levels are generic city courses. That means among the 16 levels, more than half either take place in the city or Egypt. The racetracks featured throughout the courses are rather generic as well. It’s rare to encounter anything resembling diverting paths, and when those paths do break apart, it is mere moments before they are brought together once again. Garfield Kart’s levels have some rendering issues, too. There are times, especially if you are using a fast kart, where you’ll race past a section of the level that hasn’t finished rendering yet. This either results in blurry imagery or significant lag. All of those minor annoyances can’t hope to compete with the game’s most irritating feature: its soundtrack. The entire soundtrack for Garfield Kart is comprised of five-second to 10-second tunes. There are levels where the level’s music is only made up of a handful of notes. Once those notes are complete, the tune loops again, resulting in a repetitive experience. In an odd move, none of the characters have any voice clips and dialogue, probably as a way to save costs on making this extremely cheap game. So, while you’re racing, all you’re left with are repetitive songs and your inner thoughts, which probably have to do with how much you’re hating this game. The game only has three modes: Grand Prix, Single Race, and Time Trial. Unless you just really want to unlock more silly hats for Garfield and his friends, there is no reason to continue playing after you win the Grand Prix. Completing said Grand Prix will probably take you under three hours. If you purchase this game through Steam, you can probably unlock everything and still have time to get a refund. So, is Garfield Kart a total cat-astrophe? In the end, Garfield Kart’s biggest flaw is how empty it feels. The races aren’t challenging if you just play as Jon from the very beginning, and once those races are complete, there is no reason to play the game anymore. It truly feels like a mobile game transferred to the Nintendo 3DS. It’s the kind of game you play when you’re stuck on a long flight or have time to kill on the toilet. With that said, I’ve definitely played worse. In fact, I was a bit let down that the game wasn’t worse than it ended up being. After hearing about how awful this game was, I was prepared for an utterly broken game full of glitches in the same vein as Superman 64 or Sonic 2006. 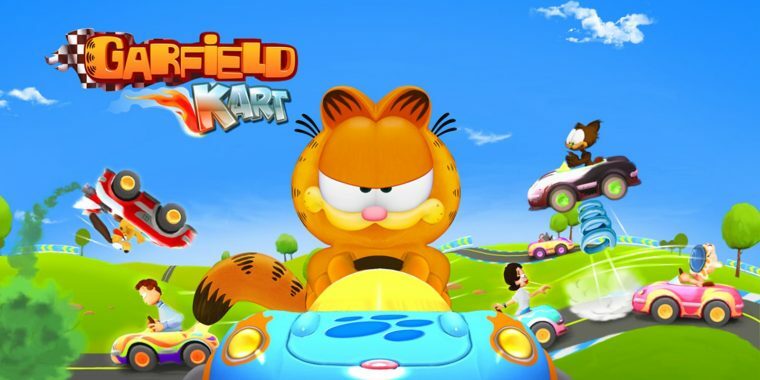 In the end, Garfield Kart is just a bland and forgettable rip-off of Mario Kart, a reflection of how modern Garfield is a hollow shell of its former self.